Thanks for the feature. Well, everybody is entitled to his opinion. I'm not sure I really understand what you're writing... You seem not to like the idea of using algorithms to create a work, and imply that somehow this lead to emotionless art. I willingly agree that my work is not about depicting emotions. But, if no one else, I do feel strong emotions especially when I "discover" the high resolution picture. Let me explain. I create them by tuning the algorithm on a low resolution preview that the computer can compute quickly. When I'm satisfied, I let the computer compute it a very high resolution. On the high resolution pictures, there are many details and features that I had no way to imagine when looking at the loew resolution preview. So I'm litteraly discovering my own work. I always feel a strong emotion at this moment. That's the beauty of algorithmic art: you get much more than what you put in. 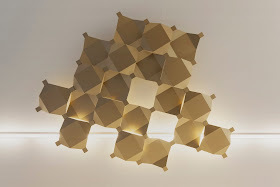 Concerning the use of the term "purely abstract", it's just that if any figurative element appears in a picture, it can only be the result of randomness, as these works are created only with algorithms (no photograph, hand drawing or anything else that could produce a figurative element). I didn't had any deeper meaning in mind than this. Depicting emotions and translating from reality are old tradition within abstraction and often this is wrongly assigned as the artist's objective. My criticism of your work is not based on your lack of intent to communicate emotion. It is because your decision to devolve responsibility to a mechanical process isn't then justified by any other rationale or emotion and the result doesn't engage me poetically or formally. It strikes me that they are visual illustrations/ translations of numerical sequences and whilst the fractal is scientifically and philosophically interesting for me it is not in itself art. 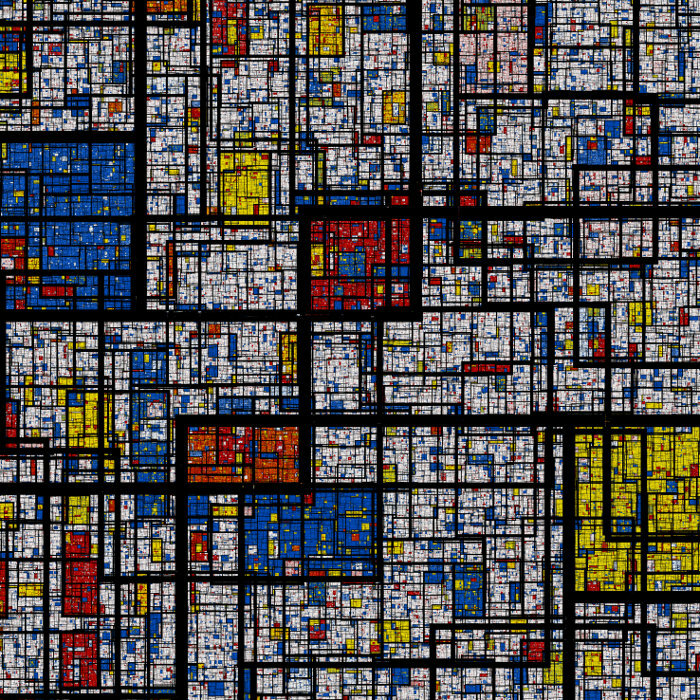 Mondrian made work that took courage to take every step, every decision, along the way. Maybe I understand a bit better. It would be a mistake to think that there is no aesthetic choices to be made when creating an algorithmic work. Dozens of low resolution previews are generated before computing a high resolution image. It's not about pressing a single button that would make a work appear magically. On the other hand, it is true, as I explained in the previous post, that most features of the work have not been envisionned and planned by the artist. I see this as a bonus. 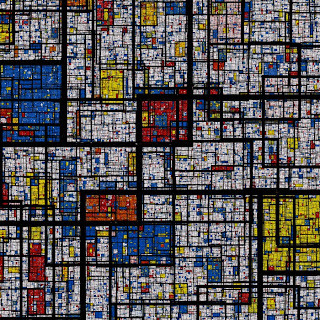 Of course, in the case of the work above, the aesthetic choice were more restricted as the aim was to get an analog of Mondrian's pattern. Speaking about the "courage" of placing a line here or a square there is simply overemphatic. However I can imagine he needed some courage to face critics and imposing his aesthetic. Anyway in no way should you see this as a way of mimicking or replacing Mondrian's work or way of working. Part of the motivation for this work is simply as a joke, taking a famous pattern and twisting it with my aesthetic. A maybe more unconscious motivation was to make an antithesis of Mondrian's minimalism. I willingly acknowledge that I am not enthusiastic about the minimalism that pervades the art of the XXth century. I understand that such work take their full meaning by considering the artist's state of mind that lead him to create his work, but this is not what I find interesting in art. 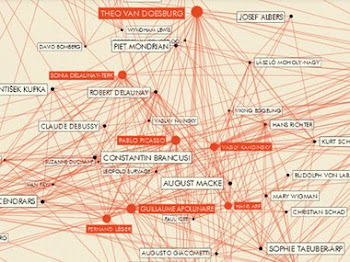 XXIth century art deserves something else and I think algorithmic art has a role to play. In particular, the beauty of the world around us lies in its infinite complexity, apparently generated by simple physical rules. Algorithmic art is a good way to mimick this feature of the world, and is the main motivation behind my work. Mr Monnier, I thank you for your willingness to engage and your patience with me, it is appreciated. There is always a value in the unplanned and expected and this can come from the medium which is part of why an artist will work with particular media. My understanding of the term analogue is different, perhaps flawed? Isn't your version of Mondrian's work and of nature's a digital version not an analogue one? 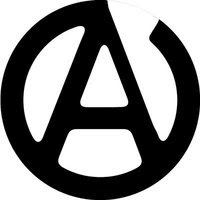 As for the courage needed to place a mark this depends on your sensibilities, awareness and what is at stake. When the creation is born of habit or mechanistic process the craft tends to take precedence and less courage is needed as the maker becomes more assured but this does not negate the awareness of what is at stake. You say you are not mimicking Mondrian but wish to Mimick nature. The fact that you declare you are making a joke of Mondrian indicates how hard it is to match his integrity and originality as an artist. The mimic is not an explorer, inventor and is bound not to discover. The discussion is drifting towards argument for the sake of the argument. I didn't carefully choose my words when I spoke about an "analogue". What I meant is simply creating something that would be recognized as being derived from Mondrian's pattern. Again, maybe "mimicking" is not the right word. Capturing some essential feature of nature would be more appropriate. I was just trying to demystify the creation of algorithmic art and explain a bit the motivation behind this fractal Mondrian pattern, for what it is good. I have no ambition to convince you. Thank you again for your contributions. Please be assured I am not being contrary for the sake of it. I wish to promote art and abstraction. Mondrian too easily becomes image fodder and artists are too easily dismissed as being without rigour in their thinking and work. I am not a scientist but I do recognise the value of a scientific approach and peer scrutiny.